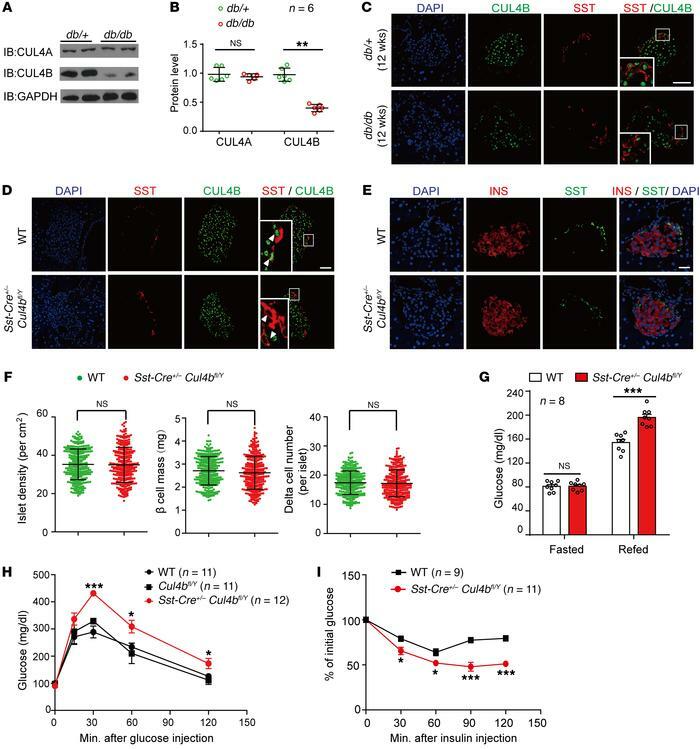 CUL4B deficiency in pancreatic δ cells impairs glucose metabolism. (A and B) Western blots and quantitative data for CUL4A and CUL4B protein levels in islets from 12-week-old diabetic db/db mice and their heterozygous littermates (db/+). n = 6 mice per group. Representative Western blots from at least 3 independent experiments are shown. (C) Immunostaining for CUL4B (green) and somatostatin (SST, red) in pancreatic sections from db/db and db/+ mice. Scale bar: 100 μm. n = 6 mice per group; 4–7 random areas were selected from each islet section, and 10 sections were randomly selected from each mouse. (D) Confirmation of pancreatic δ cell–specific CUL4B deficiency (Sst-Cre+/– Cul4bfl/Y) through immunofluorescence. The colocalization of somatostatin (red) and CUL4B (green) in δ cells of WT mice was absent in Sst-Cre+/– Cul4bfl/Y mice. Scale bar: 100 μm. (E) Immunostaining for insulin (red) and somatostatin (green) in WT and Sst-Cre+/– Cul4bfl/Y mice. Scale bar: 50 μm. (F) Quantitative data for islet density, pancreatic δ cell number, and β cell mass. n = 6 mice per group; 4–10 random areas were selected from each section, and 12 sections were randomly selected from each mouse. (G) The fasting and fed blood glucose levels of Sst-Cre+/– Cul4bfl/Y mice and their WT littermates. n = 8 mice per group. (H) Glucose tolerance test for Sst-Cre+/– Cul4bfl/Y mice and their WT littermates (n = 11–12). (I) Insulin tolerance test for Sst-Cre+/– Cul4bfl/Y mice and their WT littermates. Insulin-induced decreases in blood glucose levels were significantly lower in Sst-Cre+/– Cul4bfl/Y mice than in their WT littermates, and they did not return to baseline levels at the 2-hour time point, whereas the levels of their WT littermates did (n = 9–11). *P < 0.05; **P < 0.01; ***P < 0.001. db/db mice were compared with their db/+ littermates, and Sst-Cre+/– Cul4bfl/Y mice were compared with their WT littermates. Error bars in F represent mean ± SD; other bars represent mean ± SEM. All data were analyzed using 1-way ANOVA.